CAMBRIA COUNTY, Pa. -- A pipe is spewing toxic water into Topper Run from the old Maryland No. 1 coal mine here. Take a deep breath, and gag on the stench of rotten eggs. 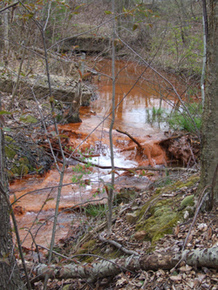 Many of Pennsylvania's waterways are orange, affected by acid mine drainage. Photo by Manuel Quinones. "We're standing on probably 3 or 4 feet of iron," said Robb Piper, manager of the Cambria County Conservation District, a government agency. Two geese are swimming in an adjacent pond. From a bird's-eye view, one can see miles of orange streams polluted with acid mine drainage flowing from abandoned mine shafts. In all, mine wastes have fouled more than 5,000 miles of Pennsylvania streams, many of which drain into the Chesapeake Bay. "I question whether they should be allowed to pollute waters of the commonwealth," said John Dawes, head of the environmental group Foundation for Pennsylvania Watersheds. And government funding for reclaiming abandoned mines has fallen far short of what's needed. Acid water dumps are not the only problem polluting land and streams in Pennsylvania's coal-mining areas. The name Nanty Glo, which translates to "coal ravine" in Welsh, is the sister village of Nantyglo in Wales. The waste piles "and water are the worst thing, the worst thing we got," Piper said. "There's complacency. People feel that's the way it is." Said Dawes of another waste pile: "This is an eyesore. This has got to be [cleaned up]. And those people seeing this from the town!" The waste piles also catch fire and are a magnet for all-terrain vehicle daredevils whose machines ride up and down the mountainous piles' steep faces. "Those are very expensive to deal with. And we have been monitoring a number for several years," said Eric Cavazza, acting director of the Pennsylvania Department of Environmental Protection's Bureau of Abandoned Mine Reclamation. And new problems continue to emerge -- from fires to cave-ins. "In essence, probably at the end of the [abandoned-mine program], Pennsylvania will have some hazard features that will not be addressed," Cavazza said. 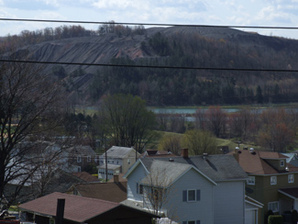 The federal Office of Surface Mining's Abandoned Mine Lands (AML) program taxes the coal industry to fund cleanup efforts nationwide, with some money set aside for restoring water quality. The issue came to a head with recent reports that Wyoming -- which got more than $150 million from AML this fiscal year -- has used its reclamation money for road construction and medical facilities. Wyoming has also reclaimed more than 1,051 mine sites. At a recent congressional hearing on AML, Thomas Baker, board chairman for the Appalachian Wildlife Foundation, said the program's cash "should be directed to where the greatest needs are for the cleanup and restoration of habitat on pre-law coal mines, and not be tied so heavily to where coal is mined currently." Greg Conrad, executive director of the Interstate Mining Compact Commission, an association of mining states, chafes at proposals to eliminate funding to certified states and tribes. "It's pretty much a half-baked argument," he said. "That's pretty much the way the amendments were structured." "The 2006 amendments were about shoring up the combined benefits fund for the United Mine Workers," Conrad said. By Congress' continuing to collect taxes on the coal industry for reclamation of old abandoned mines, the UMW could continue using interest from the AML to fund health and pension benefits. Certified Western states like Montana and Wyoming, which is now the nation's top coal producer, chafed at having companies in their backyards pay for problems east of the Mississippi River. They are still not willing to give up money they say belongs to them. Lawmakers couldn't deplete the fund without jeopardizing miner benefits. The fund's balance stands at about $2.4 billion. "It was all of those interests across the board that were a part of grand compromise that was reached in those amendments," Conrad said. "There are webs within webs and loops within loops here that are fairly complex. This was not a simple compromise." Cavazza of the state DEP said state leaders decided to invest the maximum on water improvements. "The consensus from all those stakeholder meetings favored us setting aside our full 30 percent every year to deal with mine drainage," he said. "Again, these are funds that are collected from states and tribes," she said. "And it should go back to the states and tribes." Rep. Cynthia Lummis (R-Wyo.) in a hearing last year was more blunt: "That money belongs to my state, not the federal government." Plus, she said, many mining problems linger. "We do find new sites," she said. "We do get reports from the communities, and some are coal sites, and we do go back and do out assessment." Senate Energy and Natural Resources Chairman Jeff Bingaman's bill (S. 987) has passed in the Senate and has bipartisan support in the House. The New Mexico Democrat's bill gives noncertified states like New Mexico more leeway in using coal AML funds for cleaning up non-coal sites. "It's so awful," Pennsylvania environmentalist Dawes said about the bill, worried about the thousands of coal AML sites pending in his state. At least, advocates say, the bill lets states deposit more money into their accounts for acid mine drainage. "If you're diverting money to non-coal reclamation and we already are going to have a shortfall of funds to clean up the problems that exist, we're just going to leave a larger inventory of unreclaimed [coal sites]," said Al Whitehouse, a federal mine reclamation specialist. But Obama's proposal, supported by many Democrats, has failed to get traction amid opposition to increasing industry taxes and with states wary of losing control of reclamation funding. "To people who don't understand much about this," he said, "that's another [coal plant] off the grid." But state regulators and the company are in talks with EPA about what level of treatment to require. Piper worries that EPA's asking the company to treat the dump to drinking water standards would kill the entire effort. "The goal is to actually restore waters to some usable level, aquatic life fishable-type level," Cavazza said. 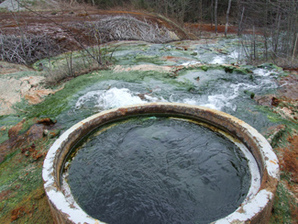 He added that money designated for acid-mine drainage efforts often go to high-priority cleanups, with others having to wait. Using $35,000 in federal funds from OSM and grants from the state's Growing Greener program, the conservation district is building a "passive treatment" facility. 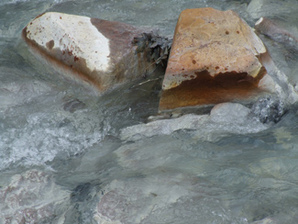 A series of limestone ponds would help cleanse tainted water and lower its acidity before flowing back into Trout Run. "There's a tremendous need in Pennsylvania for restoration of streams impacted by mine drainage," said Cavazza. "I'm sure the commonwealth would welcome more money to deal with the problems."